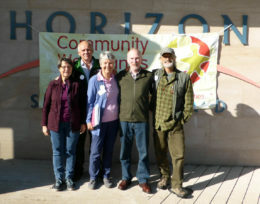 On the weekend of the 1st and 2nd of October, the CWA held its annual conference in Forres (at Horizon Scotland in the Enterprise Park). 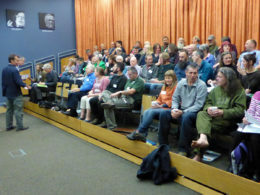 Eighty-five delegates attended representing many of the over one hundred and fifty community woods scattered throughout Scotland and on this occasion with some representation from groups in England, Wales and Northern Ireland. This year’s theme was ” Community Woods: Learning and Earning ” and five of us from The Findhorn Hinterland Trust which was one of the host groups, went along. Jonathan Caddy was well received as one of the introductory speakers, giving a presentation on what we had all done on the Hinterland since its inception ten years ago and how we hoped to move forward. 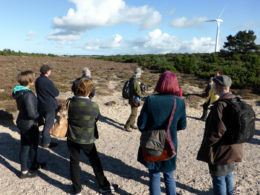 Site visits on Saturday were to Darnaway Forest, Sanquhar Woods and the Findhorn Hinterland . Twenty-four of the delegates were shown round the Hinterland with Kajedo and George as their guides. Together we were able to feel the joy that the woodland and heath lands of the Hinterland give. Of particular interest to us were the workshops and discussions on involving young people and the wider community. Accounts of work with the NHS, children of all ages, training schemes for young people in enterprise and forest related skills were just a few of the stimulating inputs. It was interesting to hear of the challenges and successes of other groups and how much we all had in common. The links between people and woodlands was a constant theme, as was the need to work towards making our projects viable for the long-term future. We left with lots of food for thought and look forward to investigating exciting possibilities further. Have a look at the photo gallery for some more pictures.